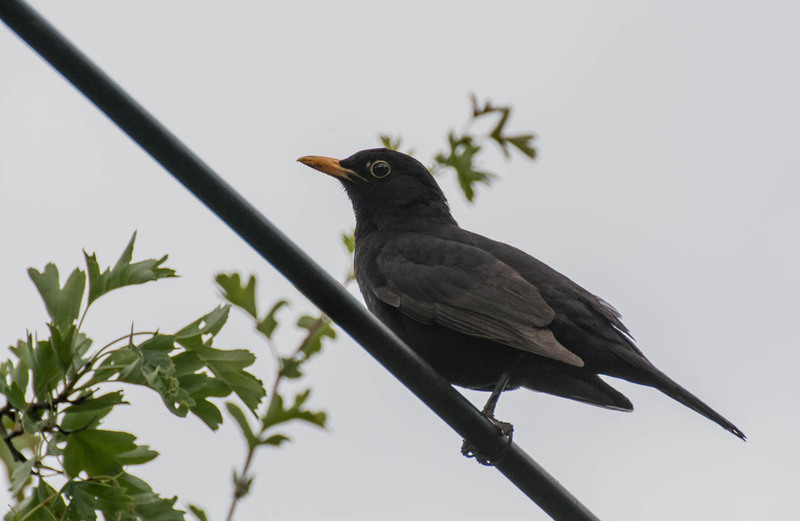 Not much to say about the photo above, apart from the fact that it is a Common Blackbird. We have them everywhere flying around in our districts. Currently I do more sports than hiking, and when I just roam around in our city districts, I shoot more common photos, like common birds, cats and stuff like that. Two days ago I was running again and was totally mad when I saw this grey heron with a fish between the beak. Of course I don’t have a camera with me when I go run. But maybe I shouldn’t complain, because I do already have a few grey heron photos on my blog, it’s just that I liked the scene with the fish so much. But well, sometimes you miss the good shots because you are doing other things, that is ok.
[ Smiles ] I love the glassy-looking eyes of that blackbird! It is maddening how you see the perfect shot just when you don’t have a camera. Recently I glanced out my kitchen window to see a robin in my maple tree. It would have been a great shot but I was in the middle of cooking and even the camera had not been in another room I had to stop and wipe my hands first. I did run and get it but of course he flew out of the tree but then he flew back to it but perched behind some leaves where I would not be able to get a decent shot. Robins don’t visit me very often and only in winter so that was annoying. Yeah that’s sad. I had these situations quite often. It actually even happens on the last meters of my hikes… when I am almost at home. At the end, in the district, I usually put my camera back into the bag… but out of the sudden, there is a squirrel on the path… I even had a common crane flying over our district when I was on my mother’s balcony, and the camera was in the living room. Same with eagles, I almost never see them, except if I don’t have my camera with me (laugh). These situations often happen. I hope you get another chance with a robin.